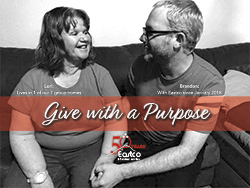 Our Give With a Purpose is Eastco’s only annual fundraiser. This fundraiser replaces our 25-year No-Show Gala. In celebration of Eastco providing care to adults with intellectual disabilities for 50 years, here are 50 reasons to donate. In this thriving economy, our caregivers are finding better salaries and benefits. Even though we’ve increased our living wage scale, we’re still losing good caregivers. There are a million other reasons, but the first reason is the one that matters. Donate today to help us attract and retain our caregivers! Donations can be made by filling out the Pledge card included in your invitation or online by clicking on the DONATE button below.